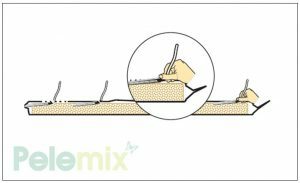 The Pre-Planting procedure is essential in order to prevent problems and difficulties during the growing period. 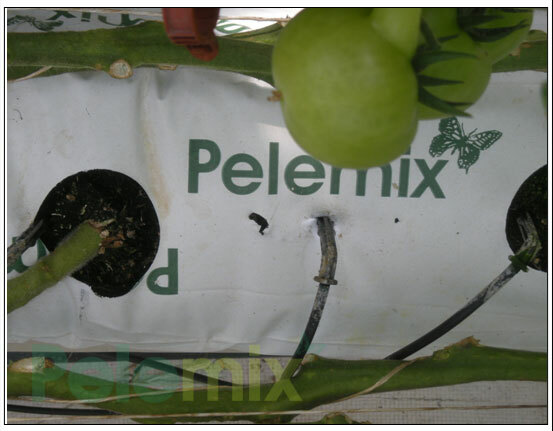 First Stage – While placing Pelemix’s growbags on top of the gutter, it is important to make sure that the side of the logo is the upper side. 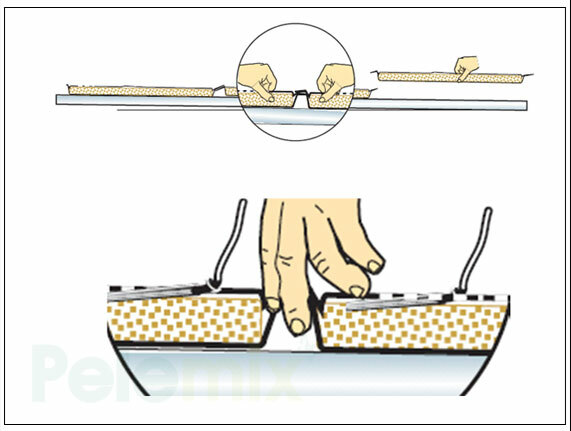 Second Stage – Make sure that the pressed material is in the middle of the plastic bag and that the plastic edges are pointed upward. The distance between growbags should be according to the planting program. 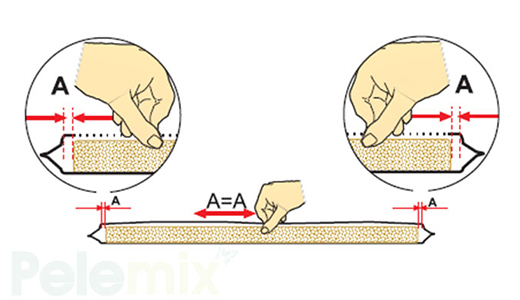 In any case the distance between two pressed slabs should be no less then 2 cm (about two fingers). 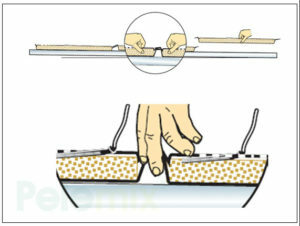 The holes in the plastic can be done with a sharp object like a screwdriver. 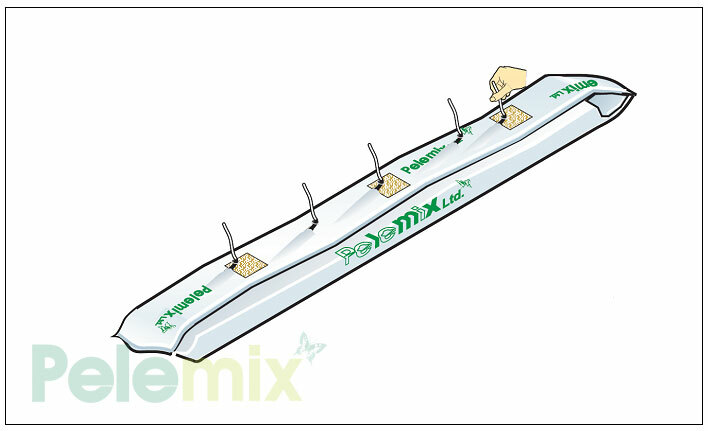 The quantity of water that is needed for a growbag to expand is about 70% of its final volume. 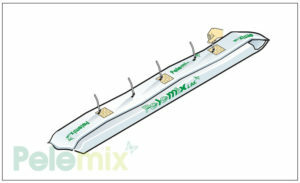 For example, the quantity needed to expand 18 liters growbag (100x15x12) is about 12 liters. 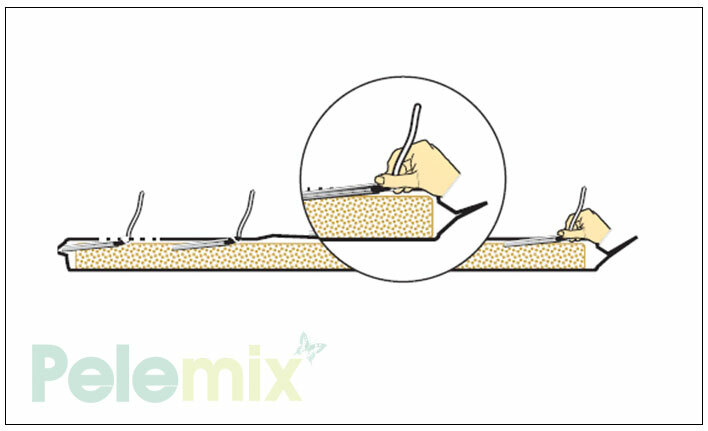 During the expansion, it is very important to apply a calcium nitrate treatment. To every expanded cubic meter [1000 liters] of coir, 3 kg of calcium nitrate must be applied. used for expansion. For example the quantities for 55 growbags of 18 liters are: 660 liters of water and 3 kg of calcium nitrate. 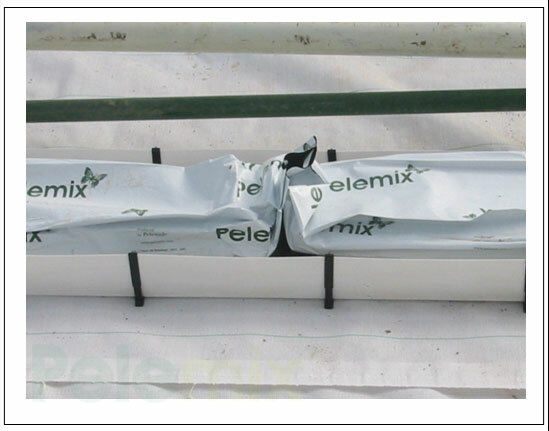 It is recommended to apply this treatment in a few irrigation cycles. 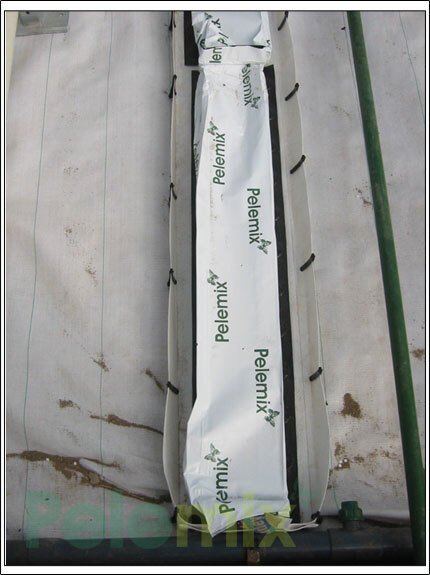 After the full treatment (after completion of the few irrigation cycles) is given the material should be suspended for 48 hours. After 48 hours, drainage holes must be made. 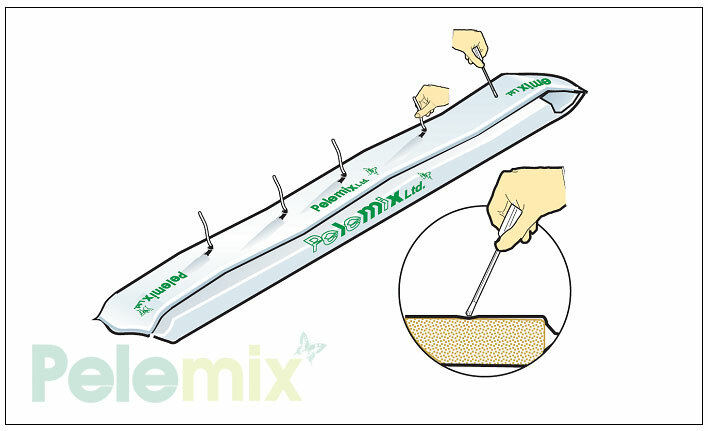 The holes must be made on both sides of the growbag, on the corner between the side and the bottom of the grow bag (On the edge of the growbag). Each hole must be 6-8 cm long. In total there should be at least four draining holes. 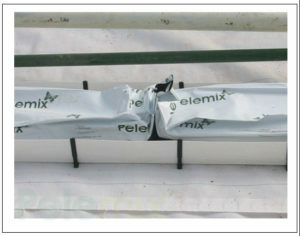 It is also possible to purchase the growbags with planting holes and drainage holes. 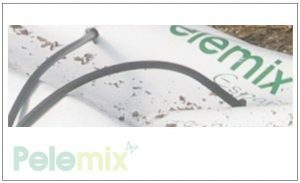 In such a case the only change is that, the calcium nitrate treatment should be applied by smaller portions of water and more cycles. The growbags must be washed by clean tap water. The washing will reduce the E.C. 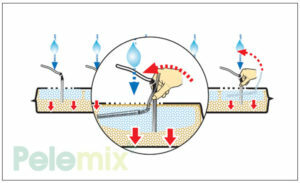 level of the drainage water to the level of the tap water. 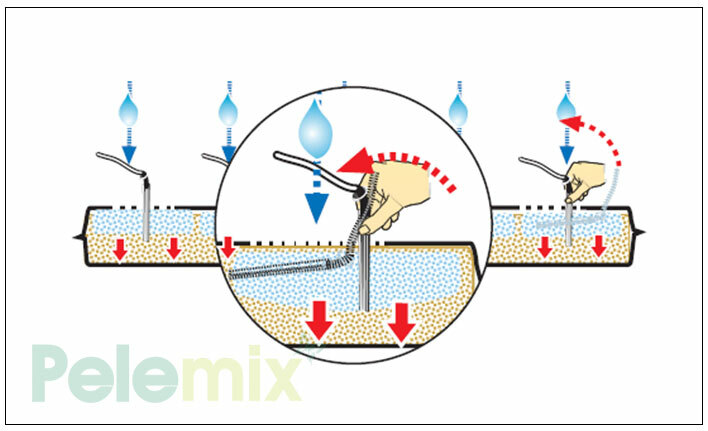 This procedure may take time and water, but is crucial for the growth of the plant. 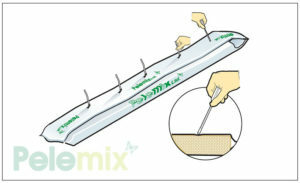 During or after washing, planting holes should be made and the arrow drippers should be reinserted into the growbag. After washing is finished, the growbags must be irrigated for 4 days with a complete Fertigation formula. When the 9 stages are successfully completed the growbag is ready for planting. We at Pelemix LTD are committed to making our own website usable by all people, whatever their abilities or disabilities. While the site has been created to be usable ‘as is’, many people are likely to get the most accessible experience of using this site by customizing their computer to suit their individual needs – for example: to get the site spoken to them, to change its color-scheme, or increase the size of its fonts. While we aim to communicate clearly and as simply as possible, some of the content may require a reasonable level of agricultural technical understanding due to the nature of our business. If you find anything on the site difficult to use please let us know on our Contact us page .